Audience/Genre: Historical Fiction, Clean Romance. Publication: August 12th 2014 by Cedar Fort Publishing & Media. 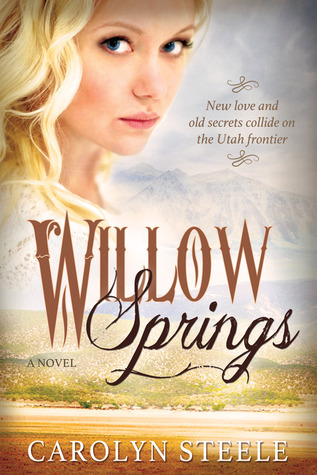 Crissa Engleson comes to the town of Willow Springs to start a new life when she attracts the unwanted attention of a miner—and falls in love with a handsome Express rider. Laugh and cry with Crissa as she escapes her past to find love and helps the townspeople along the way. From the author: In this excerpt, the reader is introduced to the town of Willow Springs, the lead character—Crissa Engelson, and the notorious group of gold miners who will be in the middle of a major conflict as the story unfolds. “Would you look’a there,” Myrtle Thompson said, nodding toward the door as a young man raced past on horseback. Cringing at the cackles coming from the dining room, Crissa peered through the kitchen doors to where the Thompson sisters dominated the near corner of the room. That table was their table—on the last Thursday of every month, anyway. There wasn’t anything special about this table except that it sat in the corner between the kitchen and the stairway and had a direct view to the front door on the opposite wall. Any comings and goings, and eatings for that matter, were thoroughly scrutinized by the ladies of this table. The unused bar was also within their line of sight, and gentlemen of proper upbringing made sure not to duck behind the bar to refill their flasks if “the sisters” were present. For Crissa’s two weeks in Willow Springs, Henders Inn had been mostly quiet, save for the few bachelor shopkeepers who took their meals here. The stagecoach had come in earlier in the evening, depositing four guests for an overnight stay. In the middle of trying to situate the travelers, the Thompson sisters had arrived for their monthly gossip fest, and to give Crissa a collective looking over. The potatoes weren’t quite as fluffy as usual, it seemed. The corn bread was too gritty, the meat loaf drier than they had remembered it—even the green beans were stringy until Molly informed the sisters that Marida had done all of the cooking, same as usual. Husbands. Crissa had to suppress a shudder at the thought. If I had wanted a husband, I would have stayed in Boston. The last thing she wanted was to get involved with any of the men in the town. Indeed, Crissa considered Willow Springs to be the nearest thing to her idea of purgatory. It was dry and desolate—nothing like the bustling city of Boston or the rich farmland of Uppsala. She certainly did not plan to stay here long. “How many will be coming?” The thought of more strange faces to watch made Crissa edgy. “Depends on if miners more hungry or more . . .” Marida winked again.